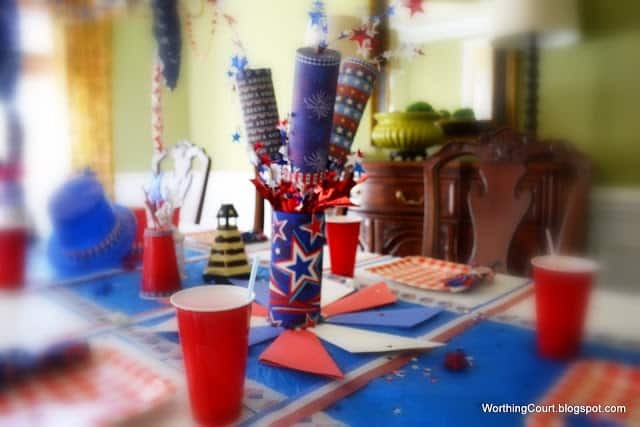 We decdided at the last minute to have a little family get-together to celebrate the 4th of July. Nothing fancy, just hot dogs on the grill and all the fixins’. We’re keeping the party indoors in the a/c so that our parents, who are in their 90’s, will be comfortable. We have a busy evening planned, so I’m using paper products to keep cleanup to a minimum. 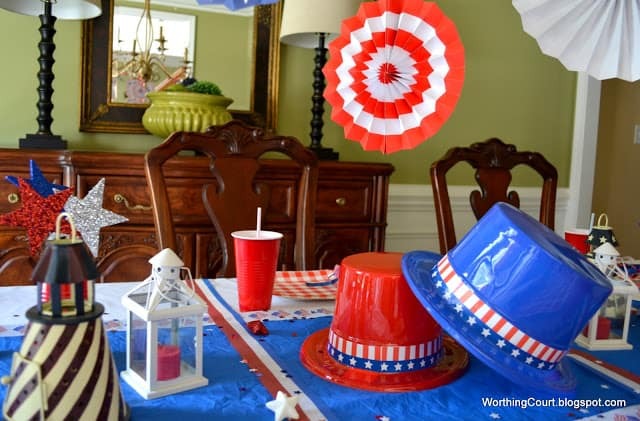 Almost everything came from Dollar Tree with just a few things from Michaels, where all of their July 4th decor was marked 50% – 60% off. I had a helper – do you spy her in the background? 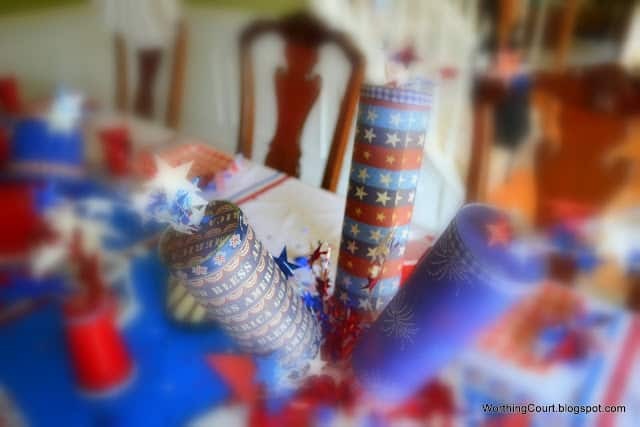 I got the idea for the “fireworks” from the ladies of At the Picket Fence. Take a look here for a complete tutorial. 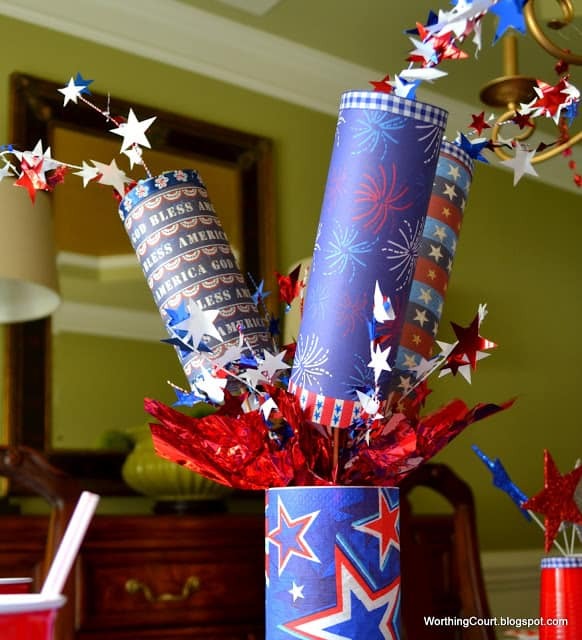 I added crinkled, red, cellophane paper to mimic the firey blast of the rockets! 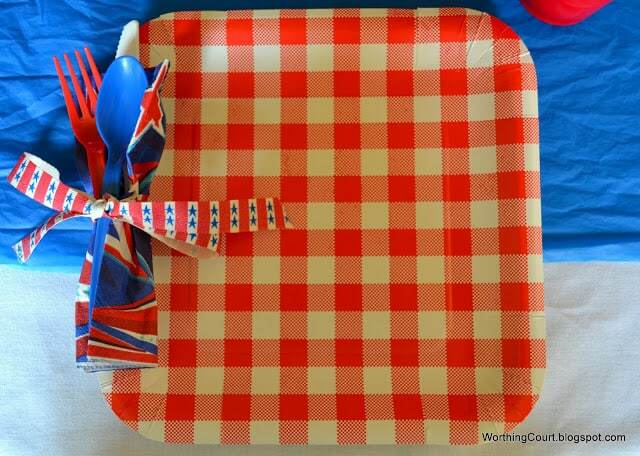 The idea for the place settings came from Diane, the creative maven of In My Own Style. Take a look at this post to see how to make them. Easy peasy! 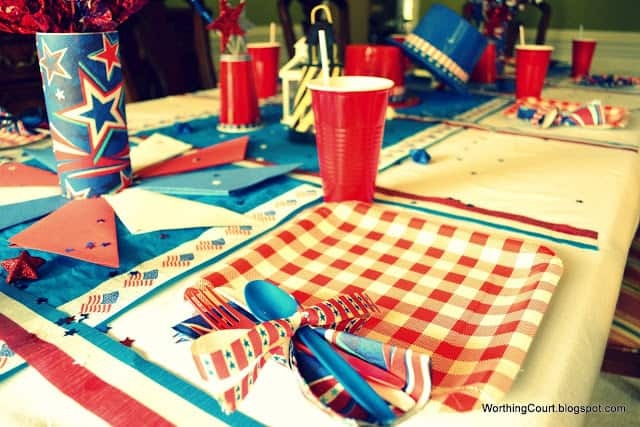 I hope you and your loved ones have an all American fun filled day! I’m going to take the next few days off and will be back next week! Love it! You are so creative!!! Happy 4th of July to you and all your family. Enjoy! 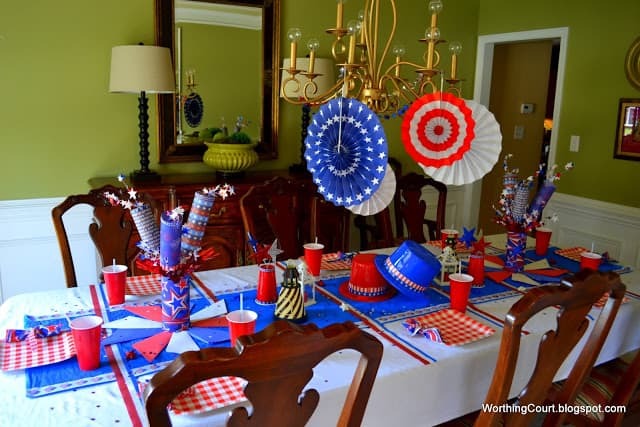 Happy 4th Suzy….Love your table!! 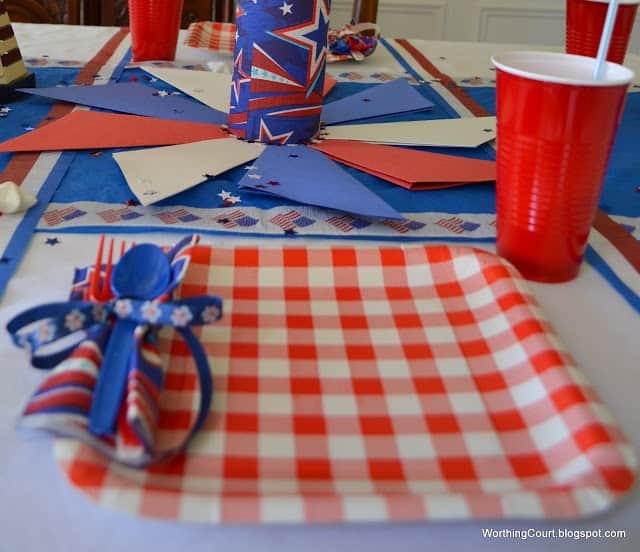 What a fun and festive table! 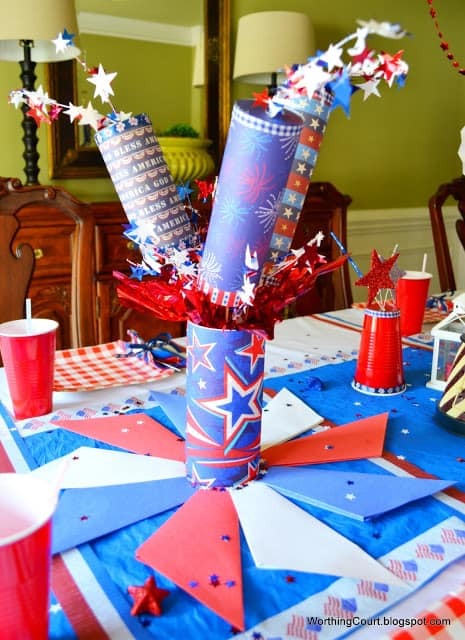 I love those “firecrackers” you made, and the whole table let your family know a celebration was about to break out! Hi, Suzy! This is my 1st visit to your blog. I’m visiting via Tablescape Thursday. 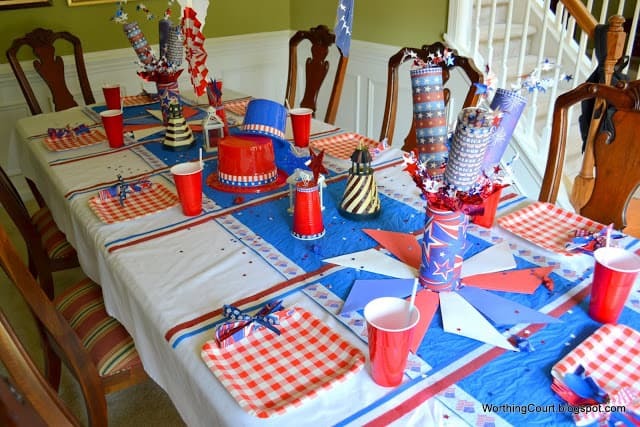 You have set up a very nice table for celebrating the 4th! 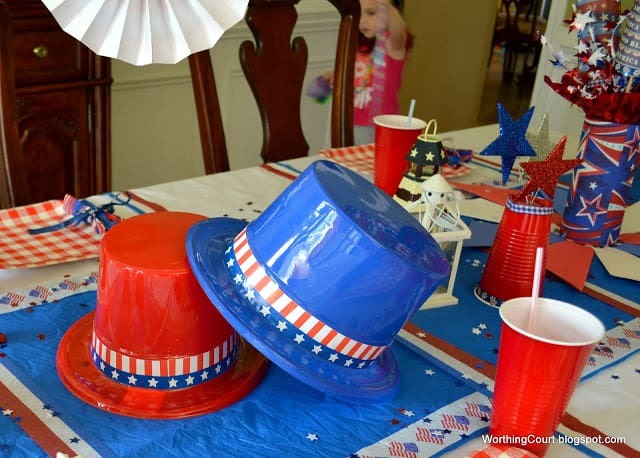 The hats add a really fun touch, and your centerpiece is lot of fun! I hope you and yours enjoyed a safe and happy 4th! Hi Suzy, Love your table. The fireworks idea is too cool, LOL! Really hot! Your little helper in the background is what this holiday is all about, God, Family and Country. We are so blessed with the freedom to express that. Your table is fun and so cute. Perfect for celebrating the 4th. The Dollar tree is wonderful with so many party goods. Love the fireworks, especially your little helper. Fun, festive with all the detail! Thank you for sharing your creativity at Potpourri Friday! I enjoyed seeing your decorations and your home tour. So pretty!